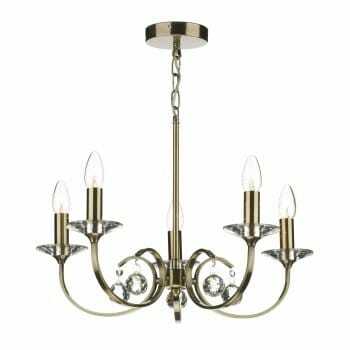 Dar Lighting Allegra 5 light ceiling fitting features a circular design ceiling plate with decorative chain, holding a chandelier style frame with scrolling arms, all in antique brass finish, with glass sconces and globe glass droplets. The product code for this Dar ceiling fitting is ALL0575. This elegant ceiling pendant will add a touch of class to any decor within your home and is suitable for use with a standard dimmer switch to create atmospheric lighting. Height adjustable at the point of installation, comes with 50cm of chain and a dual mount option to make this fitting semi flush. A 2 light wall fitting and 9 light ceiling fitting are also available in this range, in both antique brass or polished chrome finish, which can be viewed on our website.